This is the sort of thing that makes me wish I had a lot more time on my hands. September is California Wine Month, and Wine Institute - hard-working champion of the California Wine industry - has come up with five great wine country tours that will introduce you to California wine by roadtrip. Each tour is a five-day trip that covers different California wine regions, from emerging treasures like the Sierra Foothills and Temecula to the well-known grape-stomping grounds like Napa, Sonoma and Paso Robles. When combining wine tasting and cars, always remember to spit, and have a designated driver. Look at the video, then start booking hotels. The following trip ideas come from Wine Institute's Department of Tasting California Wine. Fire up the GPS and let's get moving. There’s nothing like a drive on California’s scenic North Coast to show you not only the Pacific Ocean’s dramatic beauty but also how profoundly it affects the region’s climate. That coastal influence gives us San Francisco’s famous fog, towering redwood trees, and a perfect home for cool-climate grapes like Pinot Noir, Chardonnay and others. This scenic five-day round trip from San Francisco takes you wine tasting, shopping, dining, kayaking and more. Visit Sausalito, Muir Woods national park, quaint Mendocino and Sonoma County’s diverse wine regions. Start with an invigorating walk along San Francisco’s lively Fisherman’s Wharf, taking in the shops and eye-popping views of the Golden Gate Bridge, Marin Headlands, Alcatraz, and if you’re lucky, a show-stopping patch of mysterious fog. Then put the top down and head north on Highway 101 to the artsy village of Sausalito just across the bay. Treat yourself to a seafood lunch paired with a glass of California wine before continuing north to see some of California’s famous redwood trees at Muir Woods, a national park about 30 minutes away. Stroll among the giants, and when your neck gives out from too much looking up, get back in the car and drive an hour north to Santa Rosa in Sonoma County. In addition to historic Railroad Square with restaurants, shops and a California Welcome Center to help you plan your journey, Santa Rosa is a great place to spend the night, offering centralized access to various great wine regions and wine towns in Sonoma County. From Santa Rosa, there are a lot of great options for how to spend the day. In the morning, stroll Santa Rosa’s Railroad Square, and if you’re a Peanuts comic strip fan, check out the Charles M. Schulz Museum and Research Center before heading out for lunch and wine tasting in the pastoral and picturesque Russian River Valley. If you like to greet the morning with exercise, go to Bodega Bay (where Hitchcock filmed The Birds) for a morning kayak ride, then head to the quaint town of Occidental, Freestone, Graton or Sebastopol for lunch before tasting the cool-climate Pinot Noirs of the Sonoma Coast in the surrounding areas. If your version of the great outdoors is to shop and dine alfresco, visit the fun wine country town squares of Sonoma to the southeast or Healdsburg to the north for lunch and shopping. If you head to Sonoma, explore the various wineries of Sonoma Valley, also known as Valley of the Moon. If you go to Healdsburg, check out the nearby wine regions where you’ll find Alexander Valley’s rich Cabernet Sauvignons and Dry Creek Valley’s signature Zinfandels. Overnight in Santa Rosa. In the morning, take 101 North, exiting at Highway 128 at Cloverdale. Soon you will be in Mendocino County’s wine region, a great place to stop for brunch and wine tasting. Once in the postcard-perfect, seaside village of Mendocino, most of which is listed on the National Register of Historic Places, there are many options for entertainment. You can explore the charming shops and eateries, buying your loved ones a treat at the Mendocino Chocolate Company. You can spend the afternoon exploring via scenic Highway 1, checking out historic lighthouses, such as Point Cabrillo Light Station, which features an inn or take a picnic lunch to enjoy on the grounds of the Mendocino Coast Botanical Gardens. Try hiking coastal or wooded trails such as the Van Damme Pygmy Forest Trail (in the winter months you can enjoy whale watching). Stay overnight in a romantic B&B. Head up the coast in the morning on Highway 1, passing Fort Bragg, home to the redwoods Skunk Train, and continue until you get to 101 North. Soon you will see the awe-inspiring Avenue of the Giants, a world-famous drive through more than 51,000 acres of redwood groves. There are many quirky attractions in the area, including places you can drive through a redwood, but don’t miss Rockefeller Forest’s “Champion Redwood” at 370 feet tall. If you have an extra day, travel north to Redwood National and State Parks for hiking and an overnight stay. Stop for lunch as you go south on 101 in the early afternoon towards historic Ukiah, where you can check into a charming B&B and explore the area’s wineries. If you don’t mind a slightly longer drive, before Ukiah take Highway 20 south to stay in scenic Clear Lake, the largest natural freshwater lake entirely in California and a great home base to check out wineries in the Lake County wine region, known for its delicious Sauvignon Blanc and Cabernet Sauvignon wines. Spend the morning enjoying a stroll or hike in Ukiah or Clear Lake, before making your way south towards San Francisco. Make sure to stop in the Los Carneros wine region, which straddles both Napa and Sonoma counties. Los Carneros, which means sheep in Spanish, is aptly named for the sheep dotting the rolling hills. These natural weed controllers are the perfect reminder that more than 70 percent of California’s acreage participates in California’s Sustainable Winegrowing Program, the largest of its kind in the world. As you head back to San Francisco on 101 South, you can choose among several enticing small towns in Marin County. Nestled below majestic Mt. Tamalpais, Mill Valley’s Lytton Square is reminiscent of a European village, complete with cafes, and fashionable boutiques. With celebrity musician residents like Bonnie Raitt, Bob Weir and Sammy Hagar, it’s no surprise that Mill Valley is home to the famous Sweetwater, one of the top roots music clubs in the nation, well-known for its famous guest musicians who occasionally “drop in” for an evening to improvise. The historic railroad town of Tiburon is reminiscent of a New England fishing village. Its chic Main Street – filled with trendy shops, art galleries, high-end waterfront restaurants and popular casual cafes -- is known as "Ark Row" because of the 1890s recreational houseboat lifestyle enjoyed in Belvedere Cove by sea captains, Bohemian artists, and summer residents from San Francisco. San Rafael, the oldest, largest and most culturally diverse city in Marin, boasts one-of-a kind shops, ethnic eateries and lovely Victorian buildings. Here you can also cruise down Fourth Street in San Rafael, where part of “American Graffiti” was filmed. This five-day round-trip itinerary is a foodie’s paradise, with stops from San Francisco’s Chinatown and Little Italy to Berkeley, the legendary birthplace of California cuisine. It also takes you from mountains to the sea: you’ll take in the thrilling scenery and wines of the Santa Cruz Mountains, Livermore Valley and Half Moon Bay. Take advantage of San Francisco’s food and wine culture. In the late morning, try one of the city’s walking foodie tours, such as North Beach/Little Italy, Chinatown or the Mission District (Latin Quarter). Head to Jackson Square and sample some California wines at the various wine bars. Follow up with antique shopping in this lively neighborhood, or general shopping in Union Square. Take a spooky night tour of Alcatraz, paired with wining and dining on Fisherman’s Wharf or nearby North Beach. Overnight in San Francisco. Spend the morning at a San Francisco museum or two, then put your day in gear and head east over the Bay Bridge to charming university town Berkeley. Take a guided or self-guided walking tour of the city’s famous Gourmet Ghetto, sampling the neighborhood’s culinary offerings. If you’re not too full, don’t miss Chez Panisse, the landmark eatery owned by Alice Waters, pioneer of California’s locavore movement and California cuisine. For those who love wine bike tours, skip Berkeley and head straight to Oakland, where you can do a guided or self-guided biking tour of various urban wineries, including lunch. For dinner head back to San Francisco, leave the car at the hotel and walk to any number of eateries, where you can enjoy great California wine paired with regional cuisine. Overnight in San Francisco. After a leisurely breakfast of San Francisco’s famous sourdough pancakes, drive southeast to beautiful Livermore Valley, one of California’s oldest wine regions. Enjoy lunch in charming and historic downtown Livermore, filled with quaint shops, eateries and galleries. Enjoy wine tasting downtown at one of the tasting rooms or wine bars, or check out one of the local renowned wineries, some of which date back to the 1880s! In the late afternoon, drive 40 minutes southwest to San Jose for fun and dinner on Santana Row, a Mediterranean-style shopping and entertainment district filled with chic boutiques, trendy eateries, hotels, wine bars and lounges. Overnight in San Jose. In the morning visit a museum or gallery in the charming, tree-lined streets of downtown San Jose, all within a quick stroll of each other. Or go for chills and thrills at the spooky Winchester Mystery House, featured on many haunted and mystery television shows. At lunchtime, stop by the beautiful wine country town of Los Gatos for a bite and a short stroll. Then go wine tasting in the Santa Cruz Mountains, one of California’s first designated wine regions and an area rich with wooded peaks and small vineyards tucked into quiet hillsides. Noted by “Food and Wine” as a region to watch for Pinot Noir, the region boasts smaller wineries known for Pinot Noir and Chardonnay on the west side, and Cabernet, Merlot and Zinfandel on the east. Dinner and overnight in Santa Cruz. If you like to start the morning with an adrenaline rush, head to Santa Cruz Beach Boardwalk, California’s oldest amusement park. Or if you’re more in the mood for hiking, head north on Highway 1 for a coastal trek at Año Nuevo State Park, where you can catch a rare glimpse of elephant seals. Travel north on Highway 1 to the inviting Half Moon Bay, a crescent-shaped bay filled with surfers and fishermen. Watch the surfers and enjoy lunch, wine tasting and shopping on Main Street. Return to San Francisco for the night. This adventurous round-trip itinerary starts in Napa Valley, any wine lover’s dream destination, where exquisite Cabernet Sauvignons await alongside pampering hot springs and bike tours. Then it heads for the hills, exploring Gold Country and the Sierra Foothills for gondola rides, panoramic views and off-the-beaten-path wineries before winding back down to earth in Lodi, home to some of California’s oldest Zinfandel vines, as well as the Madera Wine Trail. Travel about an hour northeast of San Francisco to delightful downtown Napa. Stroll the shops and tasting rooms, then enjoy a gourmet snack paired with local wines at the Oxbow Public Market. Head up Highway 29 and get an eyeful of scenic Napa Valley, stopping at renowned wineries for tasting and fun facts about Napa’s 16 smaller appellations. Take a break in charming wine country towns, filled with great restaurants, artisan food and gift shops, tasting rooms and wineries, such as Yountville and St. Helena. Next, head north to Calistoga, where you can enjoy strolling the shops of Lincoln Avenue or take a guided biking tour of local wineries. Or if you’d prefer some pampering, take advantage of one of several hot springs resorts, where you can relax in a natural hot spring or enjoy a rejuvenating massage or mud bath. Dinner and overnight in Calistoga. It’s worth the early morning rise to check out a hot air balloon ride over Napa Valley, which culminates with a brunch paired with local wines. Next, explore the Bothe-Napa Valley State Park, or spend the afternoon heading south on Napa’s other main artery, the Silverado Trail—once the only road to Calistoga’s silver mines and patrolled by bandits Black Bart and Buck English—to check out more wineries or any of the cool wine country towns you missed on Day One. As late afternoon approaches, head northeast about 90 minutes to Sacramento, taking scenic Highway 128 past Lake Berryessa over to hook up with Interstate 80. Explore historic Old Town and enjoy a trendy eatery and nightclub/comedy club downtown. Spend the morning at a museum, such as Crocker Art Museum, one of the leading art museums in the state, the California State Railroad Museum in Old Town, or the Discovery Museum Science & Space Center. Head 50 minutes northeast to the hidden gem Sierra Foothills wine region, known for Zinfandel, Barbera, Syrah, Viognier and incredible scenery. A great place to stop first at the Gold Rush town of Placerville for lunch, shopping and winery tasting rooms. (If you’re visiting in late spring when the snowpack melts, grab a sandwich at a deli and go whitewater rafting nearby.) To explore more winery activities, you can’t go wrong with El Dorado County wineries or other Sierra Foothill regions such as Amador County, Calaveras County, Nevada County and Placer County. Spend the evening an hour northeast in beautiful South Lake Tahoe, filled with great restaurants, glittering casinos and shows. Overnight in South Lake Tahoe. In the morning, ride the Heavenly Ski Resort Gondola for panoramic views of Lake Tahoe. Spend the morning hiking, or if you’d rather get on the road straight away, head southwest 90 minutes on Highway 88 for lunch in the fun Gold Rush Town of Jackson. Shop or savor a tasting room in town, or check out a winery or two in Calaveras County, which offers 21 tasting rooms in historic gold rush towns bordered by giant sequoia trees—and was made famous by Mark Twain’s story, “The Jumping Frog of Calaveras County.” If wine tasting in town is enough for you, and you want to live a bit of history, try panning for gold in Pine Grove. Head about 45 minutes southwest to Lodi, home to some of the oldest Zinfandel vines in California. Stop in the Lodi Wine & Visitor Center, which has an expansive tasting bar featuring a wide selection of regional wines, educational demonstration vineyard on grape growing and a gift shop featuring handcrafted products and Lodi giftware. If you’re out of time, make a plan to go there in the morning. Overnight at a local B&B. Armed with information from the Lodi Wine & Visitor Center, explore the Lodi wine region’s wineries, enjoying lunch and shopping in picturesque downtown. Another way to explore the region is the Lodi Wine & River Tours, where you glide down the beautiful Mokelumne River while sipping local wines and looking for birds and other river creatures. If you have time to venture further two hours south to check out the dessert wines of Madera, gateway to Yosemite National Park, the Madera Wine Trail is a great wine adventure. Spend the evening in San Francisco. Nothing says California more than driving a convertible with the top down up Highway 1. With the ocean in view, wind in your hair and wine on your mind, this trip takes you from Santa Barbara’s “Sideways” movie territory to the cool-climate wines of San Luis Obispo and red-wine mecca Paso Robles, then swings back to the ocean and beautiful Monterey before ending in San Francisco. Besides wining and dining, there’s a zip line, hiking, Hearst Castle, Big Sur, Cannery Row and the Monterey Bay Aquarium to interest you! From Los Angeles, head north on California’s iconic Highway 1 about two hours to Santa Barbara County, whose wine regions were featured prominently in the hit film “Sideways.” Visit Old Mission Santa Barbara, one of the state’s most famous spots on California’s Historic Mission Trail. Stop for lunch and shopping on beautiful State Street in downtown Santa Barbara. Make sure to sample regional wines at one of the street’s many tasting rooms. Dinner and overnight in Santa Barbara. In the morning, head north to the unique historic Danish town of Solvang. Enjoy breakfast and coffee at a Danish bakery or café, followed by shopping for souvenirs and admiring the Old World architecture. Do a self-guided Sideways Tour of Santa Barbara’s wine regions, including a stop for lunch at the Hitching Post, famous for Santa Maria-style barbecue and featured in the film. After the tour, head north on Highway 1 for a seafood dinner in downtown Pismo Beach. Overnight in Pismo Beach. Today, you have a choice to make: stay near the coast or head inland? To keep it coastal, spend the morning in downtown San Luis Obispo, featuring museums, Mission San Luis Obispo de Tolosa, the world-famous bubblegum alley and many shops. Enjoy lunch in one of the renowned restaurants before exploring various San Luis Obispo wineries including those in Edna Valley. Your other great way to spend the day is to head to downtown Paso Robles for shopping and dining, followed by winery hopping in the Paso Robles wine region, known for day/night temperature swings that create bold red wines. If you’re seeking a more adventurous way to explore wine country, go zip lining over the historic Santa Margarita Ranch or hiking on a coastal trail. Enjoy dinner and overnight in the charming seaside town of Cambria. In the morning, stroll the shops in Cambria and head 15 minutes north to San Simeon. Sneak a rare peek at elephant seals before heading to the world-famous Hearst Castle, the former home of newspaper magnate William Randolph Hearst. You can see his wine cellars on the Kitchen & Cottages tour, and taste his descendants’ wines nearby at Hearst Ranch Winery. Head an hour north on Highway 1 to Big Sur, the most famous stretch of the road, featuring dramatic oceanfront cliffs. Enjoy lunch at one of Big Sur’s scenic eateries, followed by a short hike among the woods and beaches of Andrew Molera State Park. If you don’t feel like hiking, take a short drive north to historic Cannery Row in Monterey, made famous in the John Steinbeck novel. Stop by the Taste of Monterey, the Official Regional Wine Visitors’ Center, where you can learn more about Monterey Bay’s unique “Blue Grand Canyon” and how it creates a unique cooling effect on the vineyards. Sample cool-climate wines from throughout the Monterey County wine region and plan your explorations for the following day. Dinner at Monterey’s Cannery Row or nearby Fisherman’s Wharf areas. Overnight in Monterey. Enjoy the morning at the world-renowned Monterey Bay Aquarium, followed by lunch in the elegantly charming Carmel-by-the-Sea, filled with great galleries and eateries. Spend a couple of hours exploring nearby wineries before heading two hours north to end your day in San Francisco. For a wine lover, there’s more to Southern California than blue skies, surf and sunshine—it’s full of surprising wine regions, where winemaking has been taking place since the late 1700s. On this five-day round trip, you’ll hit hot spots like Malibu and Palm Springs while also exploring wineries in Temecula, Cucamonga and even San Diego and Malibu. Start the morning with a guilty pleasure. Head to Grauman's Chinese Theater on the Hollywood Boulevard strip, and see how your hands and feet measure up to the autographed imprints of Hollywood legends. There you can sign up for Starline Tour’s latest two-hour tour of the celebrity homes and hangouts, the TMZ Tour. This hilarious tour, created by TMZ producers, shares insider information and the guides are on the lookout to film celebrities in action. Following the tour, grab some lunch and visit the intimate, high-elevation wineries in Malibu and other neighborhoods of Greater Los Angeles. Dine and play at the Santa Monica Pier and Third Street Promenade in the late afternoon and evening. Overnight in Los Angeles. Drive two hours south to playful San Diego, where there are many ways to enjoy fun in the sun. Start in magnificent Balboa Park, the nation’s largest urban cultural park, boasting 15 major museums, several performing arts venues, lovely gardens and many other cultural and recreational attractions, including the San Diego Zoo. Options for the afternoon include Mission San Diego de Alcala, home to the oldest grapes in California, or visiting some of the San Diego area’s 50 wineries, known for Merlot and Chardonnay. End the night with dinner and nightlife in the historic Gaslamp Quarter downtown. Overnight in San Diego. There are several “must see” attractions to explore in the morning. In addition to the zoo, Sea World and Legoland are sure bets. In the afternoon, head off the beaten path (about an hour northeast) to the fast-growing Temecula wine region, which has been growing grapes since the late 1700s. Tempered by coastal fog, this warm region is best known for its Italian and Rhône varietals—and its annual Balloon and Wine Festival. Enjoy dinner and overnight in charming and historic downtown Temecula. A popular pursuit is an early morning hot air balloon ride or biplane ride over Temecula Valley, which gives you a great view of the local wine country and ends with a champagne brunch. If you’d rather sleep in, spend time exploring the shops of downtown Temecula. In the afternoon, don’t miss the amazing bargains at Desert Hills Premium Outlets on the way to Palm Springs. Enjoy the impressive collection of Art Deco architecture in downtown Palm Springs, as well as great restaurants for dinner. If you’re feeling lucky, head to one of the many casinos, or fun evening shows like the campy Palm Springs Follies, a Broadway-caliber celebration of the music, dance, and comedy of Mid-Century America with a delightful cast old enough to have lived it. Overnight in Palm Springs. If you’re feeling adventurous, take a morning desert jeep tour, with stops at oases, ghost towns and the San Andreas Fault. If you’re feeling more laid-back, travel to the eerily beautiful Joshua Tree National Park, made famous by the top-selling U2 album. You can drive through the park at your own pace, but don’t miss the ranger-led tour of Keyes Ranch inside, which lets you get a hands-on glimpse of the tough pioneer lifestyle in this land shaped by strong winds, unpredictable torrents of rain, and climatic extremes. On the way back towards Los Angeles, check out a winery or two in the Cucamonga Valley, which preserves the past with historic ranches and vineyards and is known for Port-style wines and old-vine Zinfandel. For more ideas on these and other great California wine country road trips, including California wines, wine regions and winery activities—from tastings to tours, picnics, concerts, bocce ball and more—go to Wine Institute’s lifestyle and travel website. As we inch our way toward autumn, wine lovers turn their thoughts to harvest time. Visions of grape pickers working the vineyards fill our heads, lovingly fondling each cluster of Chardonnay, Merlot and Cabernet Sauvignon before gently plucking it from the vine and sending it on its way to the sorting table. As a result of his ill-advised adventure, Newman gets to join a group of men working in the fields. They don't get paid even a low wage. They work in chains and are watched over by a prison guard with mean sunglasses and a shotgun. At a regular job, he’d be called mid-management. Where's our shop steward? These days, a lot of grape picking occurs at night. Tractors with enough light banks to illuminate a ballpark make it easy for the harvesters to work when it’s cool. It sounds very kind-hearted, until you realize it’s done that way for the benefit of the grapes, not the pickers. I'm thinking it's jailbreak time - make a run for the nearest wine tasting event and hang out near the media. In your dirty, sweaty, tattered rags, you'll blend right in. But remember to sip, swirl and spit - otherwise, what we have here is... failure to expectorate. I once worked for a guy who reminded me so much of Strother Martin that it was creepy. We made many jokes that played off the “failure to communicate” line. I was always ready to turn in my notice at the first sight of a new hire with badass sunglasses. Paul Newman’s chain gang had to work all morning, into the blazing midday and right through the blistering afternoon. A fella could really use a cool, refreshing Sauvignon Blanc after a day like that. Or at least a Budweiser. In prison, bread and water will have to do. Come to think of it, I prefer water to Budweiser. The prisoners in “Cool Hand Luke” live in eight by ten foot cells. At work, you get a six by eight cubicle. Good behavior in prison gets you time off. On the job it gets you more work. In prison, Luke is hanging around so many felons, he thought he was drafted by the Cincinnati Bengals. The wine pairing for “Cool Hand Luke” is so easy, even Dragline could have thought of it. Newman’s Own Wine offers a Chardonnay, Pinot Noir, Merlot and Cabernet Sauvignon - all tasting great and benefitting charities. The Prisoner - Predominantly Zinfandel, with a chain gang of other grapes mixed in, this Dave Phinney favorite is one to take with you if you’re going away for a long time. Communication Block Wine - A Mt. Veeder red blend from Lampyridae Vineyards, this wine is a benefit, too. It helps kids who depend on technology for communication..
Keel and Curley Florida Blueberry Wine - Don’t make that Jägermeister face. They make it sweet or dry. And it’s really good. Larry Schaffer of Tercero Wines does a great job making rosés, a fact that gets overshadowed by the fine work he does on his red wines. Every year, I look forward to tasting his most recent pink wine - they are always interesting. I managed to pick up a couple of bottles of the Tercero Rosé from the 2008 vintage this summer. They may have been the last two bottles in the house at the Tercero tasting room in Los Olivos. If you have a bottle that you forgot to drink, it’s showing very well right now. A blend of 90% Grenache and 10% Mourvedre, this Santa Barbara County registers an alcohol number of 13.5% abv. I believe it sold for around $15. Schaffer’s present vintage rosé offers much more Mourvèdre. The ‘08 is medium pink in the glass, with a nose of melon, strawberry, cherry and hint of funky earth lurking in the shadows. There are plenty of shadows here, as the palate is quite complex. There’s fruit laced with black tea, and an especially nice zing of acidity. The tea flavor is something I don't get very often in rosés, particularly young ones. Just a few years of aging has given the wine quite a bit of complexity. A man’s home may be his castle, but one man’s Napa Valley castle is his winery. Dario Sattui - of V. Sattui fame - built Castello di Amorosa in the latter part of the twentieth century. It looks like it belongs to an earlier time. Sattui belongs to an earlier time. He has spent his life fighting long odds and naysayers in order to accomplish what he wants - needs - to do. It is compelling reading to flip through his descriptions of rebuilding his great-grandfather’s winery, traveling the world for his castle obsession and ultimately willing the enlistment of those whose help he needed. The Napa Valley estate vineyards are planted mainly to Cabernet Sauvignon, Merlot, Sangiovese and Primitivo, but he also has vineyards in Mendocino County and Anderson Valley. It is from these outlying areas that Sattui gets enough Gewürztraminer to produce four different profiles of the aromatic and fruity grape. 200 acres in Mendocino County and nine in Anderson Valley provide most of the fruit. Additional needs are handled by select growers in Mendocino. A publicist for the winery was kind enough to send samples of three Castello di Amorosa Gewürztraminer views. Gewürztraminer is a great, refreshing, white wine for summer - but don't put it in a box. Gewürztraminer is great all year round. 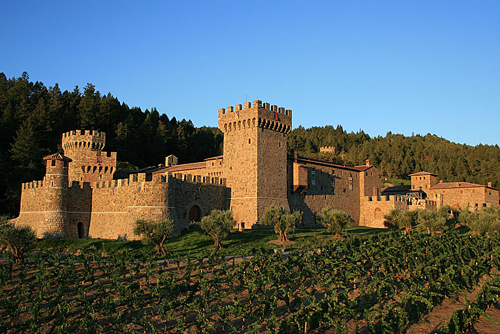 Kudos to Castello di Amorosa’s Director of Winemaking, Brooks Painter. This is the dry version, produced entirely from Mendocino County estate grapes. The alcohol level is 13.5% abv, 1,100 cases were made and it sells for $23 retail. The wine has the color of light straw and an extremely floral nose - absolutely beautiful with pears in the aroma profile. As I was tasting all three wines, Denise kept asking, “What is that? It smells great.” She smelled it from across the room. The palate shows golden apples and pears with hints of spice. There’s a great acidity and minerality package that runs from start to finish. I’d love to have it with some enormous crab legs. Dolcino means “lightly sweet” in Italian, and that’s what you get in this bottle. At only 12% abv, it’s light to drink, as well. 1,849 cases were made from estate and grower grapes out of Anderson Valley. It sells for $24. The nose is laden with honeysuckle and ripe peaches. I don’t like to gush, but the bouquets on these wines are fairly amazing. The palate is lightly sweet, as promised, with fruit up front and herbal notes and a gentle minerality flowing beneath. The acidity is more gentle than in the dry, as well. The wine finishes beautifully, with floral and fruit lingering beyond the sip. The dessert wine expression comes from estate grapes in Anderson Valley that were blessed with the noble rot, botrytis cinerea. The thick skins of Gewürztraminer make it resistant to the mold, so it’s a rare treat to have this bottling. The grapes were harvested a week into November. The alcohol is a low 11.2% abv and 2,694 cases were produced. It shows a nice golden color, a little lighter than most dessert wines. The nose of honeyed citrus comes on like grapefruit candy, while the palate is silky and viscous. Rich grapefruit and apricot sweetness drapes itself over the sides of the glass, dense and seductive, with a nice level of acidity to top it off. A lot of people like to have a few dessert wines around during the holidays, and this one would be quite welcome next to an apple pie or peach cobbler. For that matter, the dry and the Dolcino versions would be great around holiday time. All the wines of Castello di Amorosa are available only directly from the winery, either in the tasting room or online. The Pomar Junction Cab is 100% estate grown in Templeton, in the Paso Robles AVA. This is a true Paso Robles red, with an alcohol content of 15.2% abv. It’s big and bold, but it doesn’t overwhelm the senses in the way you might expect from a wine of that heft. The cork is a riot of information: Stewardship, Railroad Town of Templeton, Pacific Breezes, Paso Robles AVA, Farmhouse Tasting Room, Merrill Family, 8th Generation Growers, all topped off with railroad tracks wrapping around it. After you give it a sniff, you’ve got some reading to do while you wait for the wine to open up. This Cab is inky black and shows a really interesting nose of black plums, blackberries, prunes, tar & baking spices. It reminds of a Christmas pie in the oven. Mark it down for holiday use. The palate is extremely full in the mouth, almost creamy. Dark fruit has a touch of tar creeping in, and the finish is like coffee candy. The wow factor is high, and the drinking experience is excellent. There’s enough tannic structure for red meat, but it's so smooth it seems made for sipping. Pairing wine with chicken is easy. With all the apps available for the purpose of food and wine pairing, it's - as the Rolling Stones might have sung with a more digital upbringing - just a click away. Or, in this case, just a cluck away. Of course, we could go right to the top for a pairing with Poultrygeist. The Court of Master Sommeliers recommends Pinot Noir, Gamay, Sauvignon Blanc, Chenin Blanc, and of course, Riesling, with chicken. But then, the Court of Master Sommeliers recommends Riesling with everything. Not that the Court would appreciate being dragged into this fray. After all, it's not just chicken with which we're pairing, but killer chickens. Chickens that turn the table on man and scratch out a sign saying, "Eat Mor Peepul." "Poultrygeist" - subtitled "The Night of the Chicken Dead," takes nothing seriously, so neither will we. You can feel free to stop now and drink whatever you like while watching this film. Of course, that means you'll miss all the cheap chicken wine links later, so just keep scrolling. As in "Poultergeist," this movie involves the invasion of a sacred burial ground. In this case, a fast food franchise moves in on the memorialized dead. What erupts afterward - and erupts is the right word - is nothing for the squeamish. If you really are having coq au vin with this movie, you've got a stronger constitution that I have, and that's saying a lot. Lloyd Kaufman, the man behind the movie, says if there's a more graphic depiction of explosive diarrhea than the one in this film, even he doesn't want to see it. The sight of big chickens exacting their revenge on the employees of this eatery is played for the bloodiest kind of humor. It's a chicken dinner in reverse, with the meat served very rare. Rex Goliath Wines are represented by a big ol’ fightin’ rooster. That’s either a wrestling championship belt he’s wearing, or a collection of war medals bought in a thrift shop. The wines are all sourced from that exclusive appellation known as “California,” which is located just west of “the rest of the world.” You won’t be branded a wine snob when you plop a magnum of this down on the coffee table. Best of all, it’s really cheap. Robert Biale Vineyards makes a Black Chicken Zinfandel. For the other dark meat, no doubt. At $42 a bottle, you want it to be great. At least, you want to be able to disregard the “watch out for black chicken” sign. Chicken Killer Barley Wine - As they say in Texas, sometimes a chicken just needs killin’. Here’s the 10% beer that’ll do the trick. Rooster Hill Vineyards - From New York’s Finger Lakes, where chicken not only have lips, they have fingers, too. Psychedelic Rooster Barbera - This is serious Lodi wine. You don’t want to tangle with a psychedelic rooster. Soaring Rooster - It combines two of the worst trends in wine: the critter label and the cartoon label. Are things so bad up in Washington State that you have to resort to this? Le Drunk Rooster - More critter cartoon labeling, and this time from France, tsk-tsk. One of those "the movie starts in an hour" decisions led me to my first visit to Westside Tavern in the mall on Pico Boulevard. Just downstairs from the AMC multiplex, this is a place I'll be hitting again for pre- or post-movie dining or drinks. It's not just about the convenience. Judging from the cheese, meat and bread plate, the food is worth a trip. But you know what gets me excited. The wine list is literally loaded with selections from California's Central Coast. Why is this not standard procedure at Los Angeles restaurants? Lori Theis is the director of special events at Westside Tavern, and she does the wine list like it ought to be done here in Southern California. There are so many good Central Coast choices, I'll need a number of visits to explore them all. Our waitress told me that the list includes many seasonal choices - as it should - so I may never finish sampling the regional wines on offer. But I'll try. I was taken aback by the sheer number of wines I'd like to enjoy, and I hadn't even looked at the menu. I only knew that Denise had decided on the cheese and meat board, so I asked the waitress if she thought a red or white wine would be a better fit. She said the reds were her choice for that pairing, so I ordered the Bonny Doon Clos de Gilroy Grenache. The 2010 vintage is $11 by the glass. Denise had the 2010 Cabernet Sauvignon from Ancient Peaks, one of our favorite Paso Robles wines. It was also $11 btg. Both were served at cellar temperature, which you don't always get in L.A.'s eateries. The Clos de Gilroy is 75% Grenache, 13% Cinsault and 12% Syrah, so there is a lot going on in the glass. The wine’s grapes do not originate in Gilroy - home of the Garlic Festival - but from a smattering of Central Coast vineyards. When Denise heard me ask for the wine by name, she wondered if it smelled like garlic. It does not, although that would be an interesting tasting note. Clos de Gilroy does smell a bit like meat, with cherries and an earthy sensation in the bouquet as well. The palate shows very nice acidity with racy dark fruit flavors - I get prunes - and a medium-length black cherry cola finish. Peppery notes keep popping up. The wine is beautiful with the cheese and meat plate - an excellent match with the toasted raisin nut bread that comes with it. The Ancient Peaks Cabernet Sauvignon, by the way, shows those famous Margarita Vineyard minerals in full force, with strong, dark fruit and a nice tannic structure. This wine was one of those “Oh, look what I forgot I had” moments. This has been sitting in the rack - er - cellar, for over a year. It’s about time I break it open before summer slips away. After all, it’s a rosé. It’s actually a rosato - Uvaggio calls it that in keeping with the Italian grapes used in it. It’s a blend of 81% Primitivo, 15% Barbera and 4% Vermentino, which are all grown in Lodi, California. Uvaggio posts on their website that they make “interesting wines from very interesting Italian grape varieties.” This pink wine is made in the saignée method, by bleeding juice from red wine production. This one hits below the dozen marker in alcohol - 11.4% abv. The wine is barrel fermented, but malolactic fermentation is blocked. Earthiness abounds in this wine. It’s all over the nose and all over the palate, too. Sniff past the funk and you are rewarded with a healthy strawberry aroma, with herbal notes. Flavors almost too rich for rosé come forward as red berries and bright cherries. The acidity comes sailing in on the finish, and the wine is very pretty - a deep magenta. Interesting? It sure is. Good? Yep. Keep this stuff coming and I won’t mind summer hanging around awhile. If you've ever thought, "Man, I'd love to own a vineyard and make my own wine," you have something in common with Norbert O'Donnell. He's the owner and winemaker for O'Donnell Winery in northeast Pennsylvania. They have only been open a few weeks (as of mid-2012) but Norbert and his wife, Jeannie, are running full steam ahead. Norbert is from the NEPA area, but he was bitten by the wine bug while living in Washington's Columbia Valley. He grew to love the rich, voluptuous wines made there and found it a disappointment to return to his home state and the thin, sweet wines people seem to like there. He says he wanted to turn around and go right back to Washington. What he really did, though, is stay in Berwick, Pennsylvania and try to change the wine scene on his own. 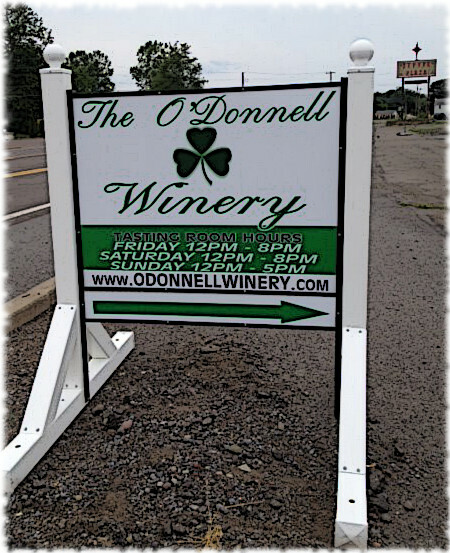 O'Donnell's vineyard is still a year from first harvest, so he is sourcing grapes from Erie, PA for his first effort at a full scale release. He currently has four wines in production, and made 1,000 liters each - about 110 cases for each wine. That's quite a step up from the hundred he had been producing for personal use with grapes from California, Washington, Chile and Italy. O'Donnell Winery is now one of 140 or so wineries in Pennsylvania. The wine list shows two dry wines - his preference - and two sweet ones - the kind people like to buy in his area. O'Donnell tells me sweet wines outsell dry by at least three to one in his part of the Keystone State. He makes a dry Catawba, a Corot Noir, a Geisenheim and a concord. The Corot Noir grape is a hybrid developed at Cornell University. It's free of the "hybrid aromas" often found in North American grapes. Geisenheim is a cross of Riesling and Chancellor grapes. In his vineyard, O'Donnell watches over plantings of Chamboucin, Cameret (a Gewurztraminer clone) , Riesling and Merlot. I hope to have a chance to taste his wines soon, and when I do I'll include O'Donnell Winery in the Now And Zin Wine Country series. The Curiosity rover has begun snooping about for evidence of life on Mars. I’ll be watching those pictures closely for evidence of wine on Mars. Paul Mantee’s character in Robinson Crusoe on Mars could have used a little martian vino, be it red or white. Had Daniel Defoe’s earthbound Crusoe known he would be marooned for 28 years, he might have tried making some wine - if only for sacramental purposes. The 18th-century Crusoe got religion by reading the Bible while stranded. Imagine what he could have accomplished, inspired by a couple of issues of Wine Spectator. Hollywood’s version of the desert island is Mars in the 1964 film billed as “scientifically authentic.” That must have referred to the Technicolor process, because little else seems to be very realistic. TFH says the movie does borrow effects from “War of the Worlds” and “Destination Moon,” and the presentation is 1964-moderne, if not exactly ripped from the pages of NASA handbooks. You have to wonder what kind of space agency decides it’s a good idea to send a manned mission to Mars with a dangerous wild animal on board. In case you’ve never had a close encounter of the simian kind before - yes, monkeys are wild. And yes, they are dangerous. They didn’t have wine on the ship, but that ape looks to me like he’s been sneaking a nip here and there. Like the original Crusoe, Mantee seems to be stuck with some horrifically inadequate companionship. At least until Friday, the intergalactic slave, shows up. Good thing he’s a quick learner when it comes to picking up language from another world. If you tour the vineyards of the Canary Islands, you may think you’re about to find wine on Mars. On Lanzarote, they grow their grapes in little lava craters to help protect them from the wind. On the Greek island of Santorini, they wrap their grapevines into little baskets, for the same purpose. Both methods produce a weird effect that looks otherworldly - particularly in Lanzarote’s volcanic ash. For that long-awaited sip of wine for Robinson Crusoe on Mars, where else to start but at Martian Vineyard. They aren’t on Mars, but they are in Los Alamos - which is close. They’ve been conducting experiments on Albariño, Grenache Blanc and Grenache that have turned out extremely well. They also captured a Santa Ynez Viognier and have already taught it to speak English. The prices aren’t in the stratosphere for wines like UFOric, Mothership, Down To Earth and Ground Central: $20 to $25 range. Domaine Font-Mars - Bordeaux wine from Mars, here on earth. White Rocket Wines - An experiment by the late Jess Jackson that didn’t exactly lift off. Red Rover Wines - If you don’t monkey around with any #$@%& Merlot, they also have Barbera and Chardonnay. 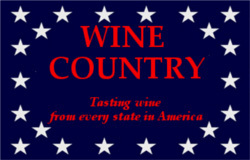 Tennessee's wine industry - like that of so many other American states - thrived until Prohibition killed it. Today, a rebirth is underway, with 33 wineries listed by the Tennessee Winegrowers Alliance. Grape growers in the Volunteer State have turned to French hybrid grapes, since they are resistant to grape diseases common to humid climates. Grinder's Switch Winery is located in Centerville, southwest of Nashville and a little south of Interstate 40. The town is more famous as the birthplace of country music great Minnie Pearl, but Joey Chessor is working on making wine as famous in Centerville as "How-DEEE!" Joey Chessor is the owner and winemaker for Grinder's Switch Winery. He named the 110-acre estate after a nearby stretch of train track. He explained to me, "Grinder's Switch is nothing more than a railroad siding on a country road. Minnie Pearl made Grinder's Switch famous when she was alive, through funny tales about an imaginary town named Grinder's Switch. Although the switch is about 3 or 4 miles away, we thought it was a neat name and used it for ours. So we decided to go with the train theme for our estate labels. Besides, my 5 year old grandson, Jack, LOVES trains." The labels for Grinder's Switch wines are very retro black and white drawings of train locomotives. I mentioned to Chessor that I remember a classic rock group named Grinderswitch, too. He remembers them as well. "We have couple of albums that were given to us by a customer framed and hanging on the tasting room wall." This red wine is slightly higher on the alcohol scale, although moderate at 13.3% abv. The grapes are estate grown. I expected a more translucent appearance from a Chamboucin, but this one is inky black. The nose is striking - tarry blackberry fruit with vanilla notes and a hint of eucalyptus. The aromas put me in mind of Cabernet, not Chambourcin. It's fruit-forward on the palate, with an intriguing minerality riding close behind. I can taste the oak influence, but it's a welcome addition, not overdone. The tannic structure is good - toothy, but it doesn't bite. This wine needs a pork chop or a plate of baby back ribs for full expression, but the pleasure of sipping it is not diminished in the absence of food. $20. If 2010 was an off-year for Tennessee grapes, I can't wait to taste what 2011 has to offer. If you did not attend the inaugural Garagiste Festival in Paso Robles last year, you must make it to Paso wine country in November 2012. Small wine producers of the Central Coast of California will gather again to pour their wines for a big crowd of appreciative people. The Garagiste Festival is all about the wines of artisan producers in the broad expanse of the Central Coast AVA. The event is again to be held at Windfall Farms. Garagiste is a French term (gar-uh-zhee-stuh) which originated in Bordeaux. There, it described mavericky small-lot winemakers who didn't care much for following the rules. These passionate vintners often whipped up their wine in the garage, or whatever space they had available to them. Nearly four dozen wineries which produce less than 1,200 cases per year will once again pour wines that you may not get a chance to taste very often. Most of these small producers don't have tasting rooms, and their distribution is often spotty, if not non-existent. It’s a big deal for them to get this sort of exposure. This years festival has expanded to four days, with events taking place on November 8th, 9th, 10th, and 11th. The Garagiste Grand Tasting event, seminars and after-party will again be held at beautiful Windfall Farms, while specialized events will take place at other Paso Robles venues, including Vines on the Marycrest, The Vintner's Vault and others. While the November 10th Grand Tasting event will remain intimate enough for festival-goers to have the opportunity to have true interaction with the winemakers, the festival has doubled capacity for this year's seminars, which were completely sold out last year. Proceeds from the Garagiste Festival will once again benefit Cal Poly's Wine and Viticulture program. They must be doing something right, as ABC News has identified the Garagiste Festival as one of their top ten Epicurean vacations for 2012. Festival co-founders Stewart McLennan and Doug Minnick did a guest shot on The Wine Down, and you can watch that webisode here. When I first saw the classic sci-fi movie, "Them!," I didn't know the meaning of needing a drink. Today, I do. It's a wonder this film didn't make me seek out my parents' wine stash years earlier than I eventually did. Water Is Never Enough. The trailer blazes the words: Terror - Horror - Excitement - Mystery - THEM! Never has an acronym so accurately described its subject. "Them" was the first giant insect movie, and still stands as the best. TFH guru Joe Dante credits this movie with scaring the preteen crap out of him, and he's not alone. Not only did "Them" feature giant mutant ants as a necessary byproduct of the nuclear age, it also featured building-mounted bullhorns from which the populace could be warned to stay inside. We had civil defense sirens where I grew up, but I always wondered what town those bullhorns were in, and what problem they were expecting that prompted their installation. Giant mutant insects, no doubt. In the coastal community in which I was raised, giant mutant crabs might have been expected, or something related to the oil industry that ruled my early years. “We Oil the World,” cried the city dads from every billboard and official vehicle. “Crabbing, too!” I always wondered about the wisdom of advertising crabbing as a great tourist attraction in an area known for petroleum refineries. That was years before people became alarmed at mercury in tuna. Giant mutant crabs would have been a welcome addition to the seafood buffet in my hometown. "Djya see thuh size uh them thangs? And only $10.95!" Pairing a wine with insects is tricky. The apps on my iPhone that offer to pair wine with food don't cover pairing with insects - for some reason. I'm guessing a white wine with a lot of acidity would work well, unless the insects are chocolate covered. Try a Port, in that case. Maybe for "Them" we could borrow a page from Monty Python and choose a wine that's good for hand-to-hand combat. Or we could go to Anthill Farms Winery of Healdsburg. Their Campbell Ranch Vineyard Pinot Noir is from the Sonoma Coast town of Annapolis (oh, if it had only been ANT-apolis!) The cool, coastal conditions there are great for growing Pinot Noir grapes, and for keeping away giant mutant ants. A wine ant, the obligatory wine chotzke. Import A-N-T Wines - This is a wine sales outfit which can’t sell to the public. Why advertise? Alcohol laws in the U.S. are certainly intriguing. The name seems to be more of a stretch than even I usually go to for the wine pairing. White Ant Wine - Q: “How many ants does it take to make a bottle of wine?” A: It depends on how much beer you give them. Believe me, winemakers are laughing their asses off at that one. And the website: “Connecting buyers with China suppliers?” Is someone having trouble finding Chinese-made products? May I direct you to … uh … everywhere? Ant control with wine vinegar - Personally, I’m more fascinated with the idea that grits kill ants. Longevity counts in wine. A winery doesn't operate over 135 years without doing a lot of things right. Simi Winery first made wine in 1876, and they have been working out of the same Healdsburg cellar since 1890. Giuseppe Simi came from Tuscany to California's gold rush in 1849, like many other Italian immigrants. Also like his countrymen who ended up far from home in California, he eventually turned to winemaking. It was over a quarter century after the goldrush that his brother joined him and the winery was born. Simi uses primarily Alexander Valley fruit for their Sauvignon Blanc. It's a blend of 95% Sauvignon Blanc, 3% Semillon and 2% Viognier. Those other two grapes help add some aromatics and fruitiness, but the real difference maker here is the region where the grapes are grown. The Alexander Valley is a fairly warm-climate grape growing area. This means the fruit is riper. The aromas and flavors are more fruit-oriented than in, say, a Sauvignon Blanc from New Zealand. The Simi Sauvignon Blanc has a very fresh nose and palate - it's a refreshing drink. The aromas are not too grassy at all - citrus and tropical notes dominate. It's lush and very fruity, with a decent level of acidity. The flavor worked well with sashimi and tempura at the Japanese restaurant where I enjoyed it. Viognier is a great choice for a summertime beverage. I had the pleasure of finally getting around to opening a bottle of Viognier that I purchased on my most recent visit to Los Olivos. Andrew Murray’s Viognier is great as a summer sipper, but it also carves out a place at the dining table. It’s a product of the Santa Maria Valley. The grapes come from a block of Viognier planted especially for Murray. The cool days and foggy nights which are common at the vineyard help get the grapes ripe without going crazy with the alcohol. The grapes are whole-cluster pressed and the vinification takes place in stainless steel. The lightly tinted Viognier shows a fruit basket on the nose, with pineapple, mango, apricot and citrus fighting for attention. Minerals are certainly present, as expected in a wine from the Santa Maria Valley. The palate really shows the minerals, as well as the wonderful herbal edge attained through the whole - cluster press. The sweetness of the fruit is tempered by lime zest. There’s good acidity and a tart, pleasing finish. I’d suggest that you run out and pick up a bottle, but that’s not possible. The 2011 yield was limited and only 50 cases were produced - those are now sold out, according to the Andrew Murray website. Since August 4th, 2012 has been designated National Albariño Day by TAPAS (Tempranillo Advocates Producers and Amigos Society) I thought I’d dig up some notes on a few noteworthy California Albariños I’ve enjoyed. White wine from Edna Valley - near the sleepy California town of San Luis Obispo - is a favorite of mine. The minerality in wines from that area comes through in flinty, chalky fashion. Tangent Winery is also a favorite of mine in Edna Valley. Tangent’s Albariño shows a tropical nose with nuts and orange peel on the palate - and tons of minerals. Winemaker Christian Roguenant says, “My aim with this wine is to keep to the classic style of traditional Albariño from the Rías Baixas region of Spain, showcasing its vibrant acidity and fresh aromatics.” Tangent offers a full menu of alternative whites, including their Ecclestone blend, a kitchen sink mix of all their varieties, including Albariño. Paso Robles’ Lone Madrone Winery makes a white blend called La Mezcla. Grenache Blanc and Albariño make a wine with great acidity, and the minerals really stand out to help shape a wonderful crispness. There are plenty of tropical notes on the nose and the palate. Their recommendation of pairing with oysters, clams or ceviche is completely justified. Bonny Doon Vineyard’s Randall Grahm makes the Ca’ del Solo Albariño. Citrus rind, wild herbs and green almond flavors dominate this crisp and refreshing Santa Cruz take on the Spanish grape. Bokisch Vineyards' Terra Alta Vineyard Albariño is picked early to imitate the style of Albariño found in Galicia, Spain. Markus Bokisch represents Spanish varieties in Lodi. That may be a lonely job, but it makes him plenty of amigos. He recommends trying his Albariño with seafood or anything spicy. Verdad Winery Santa Ynez Valley Albariño is laden with limes, oranges and minerals. Louisa Sawyer Lindquist gives it a little oak for complexity. For the dog days of summer, what could be better than a movie with some canine teeth? And some claws. And a loud bark. And a nice wine for a dog day afternoon. “The Howling” is a great 1980s werewolf film - there were a few of them back in the day. This one boasts TFH head guru Joe Dante directing a screenplay by John Sayles - not to mention the likes of Patrick Macnee, Slim Pickens, John Carradine and Kevin McCarthy onscreen. I’m in. First of all, save your silver bullets. Do you know how much ordinary stuff can kill a dog? Wine is right up there - or any alcoholic beverage. But how about milk? That’s bad for Fido, too. Chocolate, also not so good for Rover. Nor are avocados, persimmons, eggs, fish, salt, sugar, yeast or macadamia nuts. It looks like the only thing dogs can safely eat are Bonz. So why so much trouble killing werewolves? Can’t we just send them to a buffet? While swirling my Cru Vin Dogs red blend, I take offense when one of the characters in “The Howling” says, “You’re from Los Angeles. The wildest thing you’ve ever heard is Wolfman Jack.” Hey, writer, if you think wild sounds don’t happen in Los Angeles, I wish upon you every next door neighbor I’ve ever had. Have you never been rolled out of bed by dueling garbage trucks at 7:00? I didn’t think real people worked that early - just people who have to do things like get the news ready for you. If you’ve never seen a newsperson turn into a werewolf, you’re missing a treat. Oh, yeah, I’ve been around some newsrooms in my time. TV, radio, something they used to call “newspapers.” I’ve seen a few newspersons go off the deep end. I’ve seen some things I wouldn’t want to see on the big screen - it was horrible enough life-size. When I tell people about screaming arguments in which a variety of common newsroom items thrown at me ended up stuck in the soundproofing behind me, I hear gasps. I don’t have the heart to tell them I returned fire with a severely brown coffee cup that put a dent in the paneling and left a mural-sized stain that is still being talked about today. That was followed up by a left-handed sling of a half-empty pint bottle of Wild Turkey from the photographer’s drawer. The news is not pretty when you get it. It’s even uglier before that. Was I writing about werewolves? Yes, I suppose I was. Sometimes I don’t know if I can scream. Sometimes I don’t know if I can stop screaming. The news does that to me. So does Mad Dog 20/20. Let’s pair a Santa Maria Valley Syrah with “The Howling,” from Ambullneo Vineyards - not least because it’s called “Howling.” Also because it’s dark and brooding. Mad Dogs and Englishmen - Monastrell from Jumilla, Spain will go great with any movie, actually. Stone Wolf Winery - Willamette Valley wine watched over by a wolf. Do we trust him? Grey Wolf Winery - The werewolves of Paso Robles are not drinking pina coladas. They’re drinking this. Werewolf Cabernet Sauvignon - They actually have nine different wines from Transylvania - oh, wait, that’s vampire country.